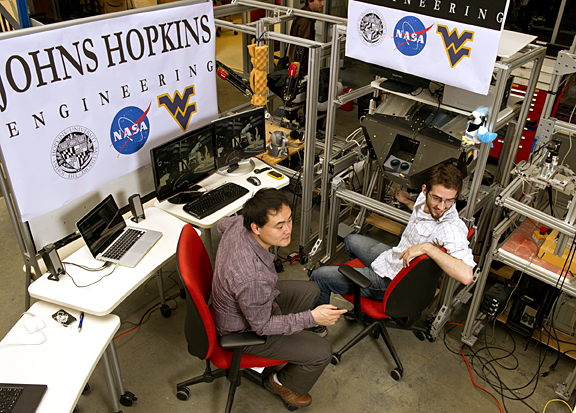 Johns Hopkins engineers, recognized as experts in medical robotics, have turned their attention skyward to help NASA with a space dilemma: How can the agency fix valuable satellites that are breaking down or running out of fuel? One option—sending a human repair crew into space—is costly, dangerous and sometimes not even possible for satellites in a distant orbit. Goddard is the home of NASA’s Satellite Servicing Capabilities Office, which was set up in 2009 to continue NASA’s 30-year legacy of satellite servicing and repair, including missions to the Hubble Space Telescope. Its aims are to develop new ways to service satellites and to promote the development of a U.S. industry for conducting such operations.